BACKGROUND AND PURPOSE: Percutaneous vertebroplasty has been performed in the United States in an increasing volume since the mid-1990s. The purpose of this study is to analyze the risk of a new symptomatic vertebral compression fractures within 1 year of having an acute/subacute fracture treated with vertebroplasty. METHODS: A retrospective analysis was performed in which 253 female patients were found to have acute/subacute vertebral compression fractures secondary to osteoporosis treated with percutaneous vertebroplasty. Occurrences of new symptomatic vertebral compression fractures were recorded for a year following initial vertebroplasty. RESULTS: Fifty-five patients (21.7%) of the 253 osteoporotic women with one or more initial fractures experienced a new symptomatic vertebral compression fracture within 1 year. CONCLUSION: Roughly one-fifth of osteoporotic women with acute/subacute fracture treated with vertebroplasty will have a subsequent fracture within 1 year. Each year, more than 700,000 vertebral fractures secondary to osteoporosis occur in the United States. This correlates to more than 115,000 hospital admissions per year (1). Conventional methods of treatment for vertebral fractures in the past have included narcotics, nonsteroidal anti-inflammatory agents, analgesics, and immobilization (2). Since the mid-1990s, percutaneous vertebroplasty has been used in the United States as a minimally invasive treatment for painful vertebral fractures and has demonstrated remarkable results with rare complications (3). It has been reported that the presence of one or two vertebral fractures at baseline in postmenopausal white women increases the risk of subsequent fractures by 11.8-fold (4, 5). The purpose of this study is to analyze the occurrence of new symptomatic vertebral compression fractures within 1 year of treatment with vertebroplasty of initial acute/subacute vertebral fractures in osteoporotic women. A retrospective analysis on 253 female patients with the diagnosis of primary or secondary osteoporosis having initial vertebroplasties performed from August 1999 to August 2003. The average age was 77.4 ± 9.3 years. The follow-up period for each patient was limited to 1 year after initial vertebroplasty session, with the last follow-up date ending in August 2004. All osteoporotic females with pathologic vertebral fractures secondary to breast cancer, lung cancer, multiple myeloma, or Paget disease were excluded. Only osteoporotic female patients with acute or subacute vertebral fractures in initial or subsequent treatment session were included. A total of nine patients were lost to follow-up secondary to death or relocation and were, therefore, excluded from the study. Acute/subacute fractures were defined by marrow edema on MR imaging (1.5T unit by using spin-echo T1-weighted, T2-weighted, and short-inversion-time inversion recovery sequences) or evidence of fracture on CT/conventional radiography along with presence of increased uptake on Technetium 99-m scintography bone scan. Symptomatic patients chosen for percutaneous vertebroplasty had no neurologic complications and had intractable pain, failed a trial of conservative therapy, or decreased activities of daily living. Typical cases involved elderly women with a short history of back pain after falling or performing a normal activity of daily living. The back pain was usually described as 10/10 and was associated with significant decrease in mobility and quality of life. After ordering conventional radiography to detect vertebral fracture, the primary care physician referred the patient to the radiology clinic. A thorough history and physical were performed by our interventional radiologists, focusing on spinal point tenderness and neurologic function. Further imaging usually involved MR images to detect the presence of acute fracture and whether retropulsion was present. After vertebroplasty, patients usually experienced significant pain relief within the first 2 weeks. If back pain recurred, the patient was asked to return to the radiology clinic for further evaluation. Our group of three interventional radiologists performed the vertebroplasty procedures by using the same technique. Sedation, pain control, and prophylactic antibiotics were provided by the anesthesiology department. Bupivacaine was used to anesthetize the skin and soft tissues to and including the periosteum over each fractured vertebrae. An 11- or 13-gauge trocar was then advanced through the pedicle under biplanar fluoroscopy guidance into the anterior-most portion of the vertebral body. Simplex-P polymethylmethacrylate, sterile barium sulfate, and vancomycin were mixed and delivered by using percutaneous cement delivery system (Stryker-Howmedica Osteonics, Rutherford, NJ) into the central anterior intravertebral space until adequate filling was achieved without extravasation. If cross-filling was inadequate, a bipedicular approach was then performed. Parapedicular approach was limited to those patients with evidence of pedicle fractures. If any paraspinal or interdisk leakage of cement occurred, injection was temporarily halted to allow hardening of cement, after which injection was reattempted. If any epidural extravasation occurred, the injection phase was terminated. Epidural venograms were performed until mid-2001. All patients were observed in the recovery room for 2 hours and then discharged to their previous disposition. Follow-up phone calls were made on 1–2 days, 1 week, 2 weeks, 1 month, 3 months, and 6 months. After 6 months, all patients were asked to contact the radiology clinic if new pain occurred. For those patients with recurrent pain, follow-up was extended to 1 year or more. All follow-up imaging ordered by primary care physicians for subsequent pain after initial procedure was performed at our community hospital. Average time between initial procedure and subsequent fracture was 10.2 weeks (range, 2–50 weeks). Many patients experienced new fractures after 1 year and were followed during this time period. Because of our cut-off period in this study, these new fractures were excluded. New symptomatic fractures were assessed by spinal point tenderness and radiologic evaluation including conventional radiographs, MRI, CT, or bone scans. All statistical analysis was performed by using SPSS software. For the 253 osteoporotic females patients, 511 levels were treated during 337 sessions. Levels treated were T2 (n = 1), T3 (n = 3), T4 (n = 5), T5 (n = 11), T6 (n = 9), T7 (n = 24), T8 (n = 32), T9 (n = 33), T10 (n = 38), T11 (n = 47), T12 (n = 79), L1 (n = 80), L2 (n = 47), L3 (n = 49), L4 (n = 38), and L5 (n = 15). Of the 253 patients with one or more initial fractures, 55 developed subsequent fractures (n = 121) within 1 year. Sixty were adjacent to previous treated levels, and 61 were nonadjacent. From Table 1, of the 253 osteoporotic female patients with one or more symptomatic fractures, 55 (21.7%) had a subsequent fracture within 1 year. For those patients with only one fracture, 21.4% developed a subsequent symptomatic fracture within 1 year. For patients with two initial fractures, 22.5% had a subsequent symptomatic fracture(s) within 1 year. Only 27 patients had three or more initial fractures; 22.2% of these patients developed subsequent symptomatic fracture(s) within 1 year. Prevertebroplasty bone mineral density measurements were available for 50 of the 253 patients in our study. The number of patients with anterior/posterior lumbar t scores and their corresponding number of initial fractures are summarized in Table 2. Of the 50 patients in Table 2 with available BMDs, eight sustained a new fracture within 1 year of vertebroplasty. These results are reported in Table 3. From these two tables, of the 12 patients with t scores below −2.5 and two initial fractures, three sustained a new fracture within 1 year of vertebroplasty. In our study, the spatial distribution of all levels injected with polymethylmethacrylate was reported. Although all three interventional radiologists used low-volume cement injection, in only 70% of the 511 levels were cement volumes reported. The average cement volume for these levels was 5.25 mL. Disk extravasation was studied in our patients. Of the 55 patients experiencing a new fracture within 1 year, 20 patients had disk extravasation. Of the 20 patients with disk extravasation, only five had an associated subsequent adjacent fracture. The prevalence of moderate to severe vertebral compression fractures has been reported to be as high as 26% in females of white descent at 85 years old (3). Traditional, conservative methods of treating these numerous fractures in the past used bed rest and analgesics. With an increasing average life span in America, more morbidity and mortality will be experienced from untreated symptomatic vertebral fractures. For instance, there is a 9% loss of forced vital capacity for one chronic thoracic vertebral fracture (4, 6). In addition, an increased mortality rate has been associated with vertebral fractures (7). Percutaneous vertebroplasty has been recently used in the United States to palliate symptomatic vertebral compression fractures. Controversy exists whether vertebroplasty causes new fractures. In our analysis, we studied subsequent symptomatic vertebral fractures within 1 year after having an acute/subacute fracture treated with vertebroplasty in osteoporotic females. We compare our results to a study by Lindsay et al that revealed the natural occurrence of vertebral fractures in osteoporotic females (average age, 74.0 ± 7.1 years) 1 year following an incident fracture treated only with conservative medical therapy. Of 312 women in the Lindsay et al study who had one or more fractures, 21.9% developed a subsequent fracture within 1 year (8). In our study of 253 osteoporotic females (average age, 77.4 ± 9.3 years) who underwent vertebroplasty after having at least one incident of acute/subacute fracture, 21.7% of the patients developed a new symptomatic fracture within 1 year. Although these two percentages are similar and may suggest that vertebroplasty does not increase the rate of refracture when compared with conservative therapy, several limitations exist when comparing our research to the Lindsay et al study. In our study, only symptomatic acute/subacute vertebral body fractures treated with vertebroplasty were included in the analysis. In the Lindsay et al study, the diagnosis of vertebral fractures was made only by lateral spine radiographs. In our study, conventional radiographs, including lateral spine radiographs, failed to show multiple subacute vertebral fractures that were apparent on MR imaging. A limitation in our study is that asymptomatic compression fractures were not detected in patients who received complete pain relief from their initial vertebroplasty because they did not need follow-up imaging. When considering the risk of subsequent vertebral fractures after vertebroplasty, one must consider the predisposing factors that may contribute to its occurrence, in particular BMDs, cement volume, and disk extravasation. It has been found that women with low bone mass (<33rd percentile) and the presence of two or more prevalent vertebral fractures increases the chances of a new fracture by 75-fold, relative to women with bone masses above the 67th percentile and without prevalent fractures (7, 9). Only 50 of the 253 patients in our study had prevertebroplasty BMDs. The results are summarized in Tables 2 and 3. Table 2 reveals a trend of increasing prevalent fractures with decreasing BMDs. Table 3 reveals a trend of increasing incident fractures with decreasing BMDs. Other factors discussed in literature that may be associated with subsequent fractures after vertebroplasty include cement volume and degree of intervertebral disk extravasation (10, 11). Ex vivo studies have related different volumes of cement and correlated to various regions of the spine to restore strength. Belkoff et al revealed that vertebral body strength was restored with 2 mL of Simplex 20 in all regions of the spine. Vertebral body stiffness was restored using 4 mL of Simplex 20 in thoracic and lumbar regions, whereas 8 mL were required in thoracolumbar regions (12). With our average reported cement volume of 5.25 mL, we followed the low-volume vertebroplasty. In addition, cement extravasation was noted in our retrospective analysis. Of the 55 patients experiencing a new fracture within 1 year, 20 patients had disk extravasation. Of the 20 patients with disk extravasation, only five had an associated subsequent adjacent fracture. For these five adjacent fractures after disk extravasation, the average time between subsequent fractures was 5.2 weeks. Most of the cement extravasation was minimal, because we used low-volume cement injection. Concerning the issue whether extravasation causes new adjacent fracture formation, we think it would be interesting to analyze extravasation quantity, geometry, patient’s baseline BMD, and level of physical activity after vertebroplasty. A study of disk cement leakage causing adjacent fractures by Lin et al revealed that 14 of 38 patients experienced new fractures; 58% of vertebral bodies adjacent to a disk extravasation fractured compared with 12% of vertebral bodies adjacent to a disk without cement leakage (11). For our 55 patients who refractured during our follow-up period, our leakage volumes were small and only 25% of the disk extravasations were associated with subsequent adjacent fractures. Figure 1 illustrates a typical example of our extravasation. 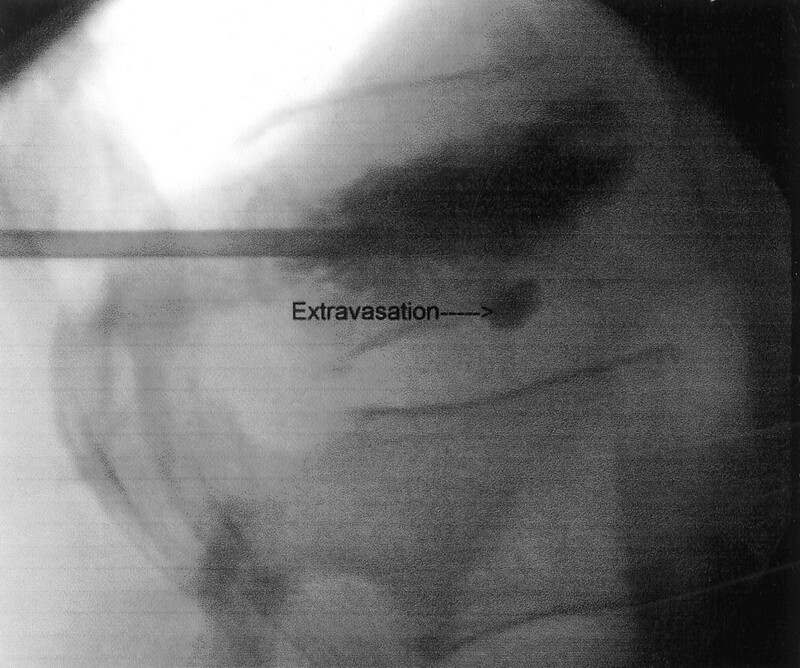 Example of typical extravasation on lateral fluoroscopic view. A study by Grados et al also suggests that vertebroplasty may increase adjacent fracture formation. In this study of 25 patients, 13 developed a new fracture over an average follow-up of 4 years. In this analysis, the odds ratio for subsequent fracture of the adjacent vertebral body was 2.27 compared with 1.44 for an adjacent fracture next to an untreated vertebral body (13). In our analysis, 121 new fractures occurred for the 55 patients with one or more initial fractures. Roughly 50% of these were adjacent and 50% were nonadjacent. A previous series by Uppin et al revealed that 22 of 177 patients experienced subsequent fractures over a retrospective time of >2 years. 67% of subsequent fractures were adjacent to previously treated levels, whereas 33% involved nonadjacent levels. The average volume of polymethylmethacrylate in this study was 9.14 mL (14). Our average volume for 70% of the levels was 5.25 mL. Whether vertebroplasty does or does not increase the chance of having a subsequent fracture is a topic that awaits further investigation. It is important to realize that the most important risk factor for having an additional fracture is the underlying osteoporosis itself. It is also important to consider patients activity level when studying the rates of refracture after an incident fracture. For patients with symptomatic fractures that were not treated by invasive means, decreased mobility or inactivity secondary to pain may be present. This may have a protective effect in preventing new fractures. On the other hand, patients’ postvertebroplasty status may have increased mobility secondary to relief of pain, which may actually predispose them to new vertebral fractures. Future research correlating activity level with the development of subsequent fractures would be helpful in this analysis. Once a patient presents to medical attention with an osteoporotic vertebral body fracture, even with conventional conservative treatment, that patient is at significantly increased risk of presenting within a year with an additional osteoporotic vertebral body fracture. It seems that once an osteoporotic vertebral fracture occurs, further clinical progression is likely (8). Whether vertebroplasty does or does not slightly increase the incidence of an additional vertebral body fracture probably awaits additional investigation. The overwhelming risk factor for an additional fracture is the underlying osteoporosis itself. We conclude that roughly one-fifth of osteoporotic females with one or more fractures will develop a new symptomatic vertebral compression fracture(s) within 1 year of vertebroplasty. From this analysis, physicians performing vertebroplasty can offer their osteoporotic patients with a realistic expectation of the chances they will refracture within 1 year. We are grateful to the Mercy Medical Center and the special procedures team.